Soundbase TV Speaker System The audiophile quality solution for those in search of a home theater experience without the space for multiple speakers, amplifiers and wiring. The Fluance Soundbase is designed for placement under your TV providing a cinema performance guaranteed to surpass your expectations. Creating a surround sound experience for movies and music in a single cabinet design is no easy engineering feat. Fluance has successfully crafted a compact full-range speaker configuration because even small spaces deserve large sound. What is a Speaker Break-In Period? When it comes to TV sound, typically the audio source comes from either the television speakers, a 5 speaker set, or a sound bar - until now. At Fluance we believe that everyone should experience audio in its truest form, so we created our TV soundbase to provide enhanced home theater sound within a compact audio solution. To create an enveloping surround sound effect Fluance incorporates Grammy award-winning sound processing technology resulting in a widened 3D soundstage. Speakers are housed in an acoustically tuned cabinet to produce a warm, natural and full dynamic range of sound. Angled drivers and digital signal processing produce a 3D surround sound effect emulating side and rear audio similar to a full 5.1 home theater setup. An extended cabinet depth constructed from engineered wood creates an optimal volume of air for superior bass performance. An integrated amplifier results in an efficient all in one solution. 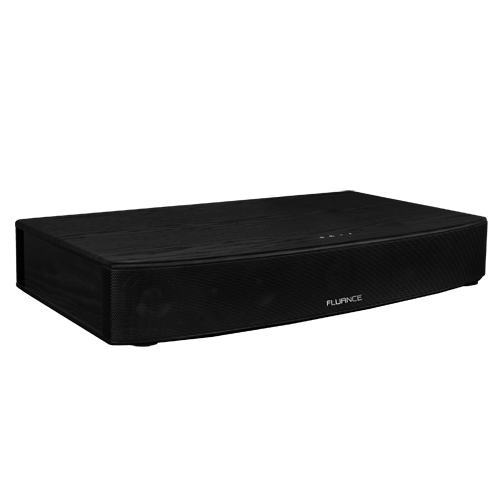 Compacting the home theater experience shouldn’t mean compromising on sound, place your TV on top of the Fluance Soundbase for Serious Performance.